The Connecticut Audubon Society’s Roger Tory Peterson Estuary Center is hosting a 2018 Fall Lecture Series, which opens this evening with a lecture on songbird migration. These lectures are free but seating is limited. Thursday, Oct. 4, 5 p.m.
Bruce Beehler, a research associate in the Division of Birds of the Smithsonian’s Museum of Natural History will recount his 100-day journey in 2015 following the spring songbird migration from the coast of Texas, up the Mississippi, and then into the North American wood warblers’ breeding grounds in northern Ontario and the Adirondack Mountains of New York. His presentation touches on wildlife, nature conservation, migration research, American history, and rural culture. Thursday, Oct. 18, 5 p.m.
Connecticut and its residents have a strong history of support for protection and conservation of the environment. Our coastal and estuarine communities have a particular interest in policies and strategies to mitigate sea level rise, storm surge and protect wildlife habitats. Yet, budget constraints at the local level, state deficits, and rapidly changing federal policies with respect to standards, regulation, and enforcement, present challenges. Some states have chosen to maintain their own strict standards. What can a small state like Connecticut do? Our speaker, Commissioner Rob Klee of the Connecticut Department of Energy and Environmental Protection, will address the challenges that policy makers face and how we can be effective advocates. Thursday, Oct. 25, 4 p.m. Between 2000 and 2017 Rob Bierregaard and his colleagues placed GPS satellite transmitters on 47 adult and 61 juvenile Ospreys from South Carolina to the Avalon Peninsula in Newfoundland. 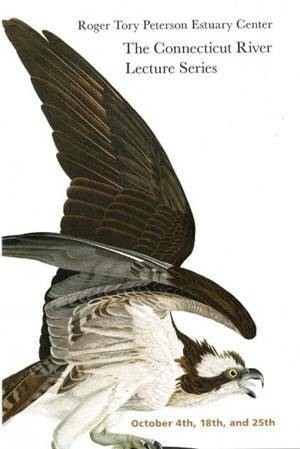 In 2013 a friend suggested that Rob write a book for children about his favorite Osprey. Five years later, Belle’s Journey: An Osprey Takes Flight, a middle-school book, was published. Rob Bierregaard will highlight his findings from satellite tracking studies of Osprey migrations and describe his own journey as a first-time children’s book author. Note: This is a family friendly lecture. We urge you to bring your children and grandchildren.